NEW YORK, Jan. 9, 2019 /PRNewswire/ -- Concierge Auctions has announced a prized upcoming lineup, featuring a collection of top-tier properties for its January Live Auction Sale in Arizona. Including some of the most expensive properties in the Grand Canyon State, five of the eight properties will sell Without Reserve to the highest bidders. Bidding will open digitally on January 29th via the Concierge Auctions online marketplace, conciergeauctions.com, which allows prospective buyers to participate in real-time from anywhere in the world. 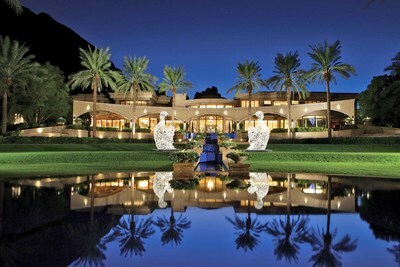 The sale will culminate at a live auction at The Phoenician, one of Scottsdale's most luxurious resorts, on January 31st. Previously listed for $35 million, Villa Paradiso is currently owned by hedge funder and avid art collector Robert Sussman, and is widely known as Arizona's most expensive listing. The 30,858-square-foot mansion — designed by renowned architect and planner Vernon D. Swaback, an apprentice of Frank Lloyd Wright — features a grand rotunda with coffered dome ceilings, twin staircases with intricate railings, floor-to-ceiling windows, and multiple fireplaces. The expansive, eight-bedroom home was built to entertain and includes a chef's kitchen with two islands; custom cabinetry and commercial-grade appliances; a master wing with his and hers' custom dressing rooms, a beauty salon, private office, kitchenette, and access to multiple outdoor terraces; a circular, glass-enclosed water room with silver leaf ceiling; a 1,250-bottle wine cellar; trainer-quality gym; Theo Kalomirakis-designed custom theater with a 3D projection system, twilight ceiling, and stage; caretaker's suite; game room; and basketball court with skybox and digital scoreboard. Situated on eight acres, the estate offers expansive views of the exclusive Paradise Valley and boasts numerous amenities including custom-built spaces to house art and automobile collections, an interior bridge connecting both wings of the home, two elevators, a 10-car garage and five additional covered parking spaces, and a 3,636-square-foot private guesthouse with private infinity-edge pool. Most notably, the estate offers exquisite landscaping designed by celebrated artist Christie Ten Eych featuring a resort-style pool with several black stone pools and waterfalls; a hot tub; pool house; and outdoor terraces for dining, entertaining, and lounging. "My wife and I moved from New York and wanted to build an elegant resort-like estate in Arizona. We spent five years on the project and wanted it to be self-contained so we would never want or have to leave," stated Sussman. "We have chosen Concierge Auctions to sell our home because of its expertise in the industry, and its impressive national and international reach to buyers. We look forward to the outcome of the Arizona Sale." The estate is marketed in cooperation with Sandra Wilken Properties. Designed by award-winning architect Erik Peterson, 8055 North Mummy Mountain Road is an extraordinary private enclave on more than five acres in the heart of Paradise Valley, Arizona. Featuring timeless details including hand-laid stone and reclaimed Chicago brick exteriors, custom wrought iron accents, soaring coffered ceilings, stone columns, and arched doorways, the 25,416-square-foot Mediterranean estate is currently owned by MLB legend Randy Johnson. The property features a dramatic two-story entry foyer; seven en-suite bedrooms; 12 bathrooms; a separate master wing with access to a trellised rose garden; a gourmet chef's kitchen with large island and peninsula bar seating for eight; a cinephile's dream home theater with tiered seating; a music lover's entertainment wing with a dedicated recording studio, live performance stage, and collector's music instrument showroom; a separate billiards room and wet bar; a poker room; two executive offices/studies; a three-story elevator; and a climate-controlled wine cellar. The private compound sits at the base of Mummy Mountain, offering sweeping views of the resort-style pool area, cabana, two-story waterslide, fire pit, surrounding mountains, and twinkling city lights beyond. In addition to the main home, there's also a free-standing, 1,800-square-foot fitness center; an eight-car motor court; a three-car display garage with mechanic's area; a pet suite with indoor grooming space and gated dog run; and a detached, 1,936-square-foot guest house featuring two en-suite bedrooms, a guest bathroom, and full kitchen. Known for its desirable lifestyle, enviable mild weather, and nearby access to world-class golf, five-star dining and luxury shopping, Paradise Valley offers the best attractions with something for everyone. With easy access to the hiking trails in Echo Canyon and Camelback Mountain, and a myriad of cultural activities in Old Town Scottsdale, the lifestyle in Paradise Valley is filled with comfort, ease and joy. "My children have all since grown and gone off to college, and it's time for us to move on and part from our family home as well," says Johnson. "Just as you would sell art and cars through auctions, real estate auction firms provide an alternative platform to sell ultra-luxe properties efficiently within a given timeframe. I chose to partner with Concierge Auctions because of their proven track record for being a leader in this space and look forward to the results." Previously listed for $14.5 million, the estate will sell furnished and Without Reserve in cooperation with Robert Joffe and Jonathan Friedland of The Joffe Group, Launch Real Estate LLC. "The upcoming auction is a very compelling opportunity to own a spectacular Mediterranean estate in the heart of Paradise Valley," says Friedland. "A property of this magnitude and quality rarely comes to market. It truly offers something for everyone — from the commercial-grade fitness center and studio-quality home theater to the gourmet chef's kitchen and top-of-the-line appliances. To build something similar would take at least three to four years and require an almost unlimited budget." Set on more than three and a half acres, 27341 North 102nd Street — designed by Jeff Biever Architecture and Mariette Gomez Design Group — offers a traditional adobe exterior with contemporary interiors featuring a light-filled, open floor plan with multiple floor-to-ceiling fireplaces, soaring ceilings, skylights and walls of windows. In addition, stone and hardwood floors line the main home, and custom niches provide elegant spaces for displaying art and sculpture. The eight bedroom estate also offers a very spacious chef's kitchen with custom cabinetry, walk-in pantry, large island, and multiple ovens; a master sanctuary with a private balcony, enormous spa bath, fireplace, and clerestory windows; a downstairs fireside lounge, an elevator, three-car garage, wet bar, library, and game room. Outdoor amenities include a swimming pool with waterfall and underground waterslide, pool house, multiple covered and open terraces, a cooking ramada, areas for outdoor entertaining, an expansive patio space and a private guest house. The property and surrounding areas also feature large, dramatic rock outcroppings and natural beauty that are unique to the area, as well as 20 different types of cacti, succulents and trees, including chollas, ocotillo, saguaro, and prickly pear, that provide for a Southwest, Sonoran Desert landscape. 360-degree views of mountains, peaks and boulders, abound as close as 100 to 500 feet away up to 10 to 20 miles away. The multi-structure, Southwestern oasis is located within the guard-gated community of Estancia, where Residents have access to the private member-owned Estancia Club, one of the most unique and scenic communities in Arizona — equipped with a fitness center, spa, and swimming pool, and offering outdoor and social activities — and its famed Tom Fazio-designed championship golf course. The property will sell inclusive of furnishings valued over $2 million, and the winning bidder will have the exclusive right to purchase without a buyer premium the three adjacent home sites in addition to the three lots on which the property is situated. Collectively valued at $13 million, this property was previously listed for $9.5 million, the estate will sell Without Reserve in cooperation with Julie Rohr and Walt Danley of Walt Danley Christie's International Real Estate. Situated on nearly six acres in Arizona's White Mountains, the 9,800-square-foot energy-efficient home boasts cedar exteriors, a metal roof, a stamped concrete patio, and custom wrought iron railing on the porches and balcony with matching fencing. Indoors, the home features impeccable materials and craftsmanship throughout including custom millwork, granite, and surround sound system; an antique European front door from the 1890s; solid Brazilian walnut floors; two walnut staircases; soaring cedar tongue and groove vaulted ceilings; and floor-to-ceiling windows and stone fireplace. Comprised of seven bedrooms, the retreat features plenty of space to entertain including a grand foyer; chef's kitchen with custom cabinetry and commercial-grade appliances; family room with access to back deck; formal dining room; formal living room; a 2,000-square-foot master sanctuary with built-in humidifier, wet bar, gas fireplace, sitting area, his and hers' custom dressing rooms, and infinity-edge soaking tub; a home theater; billiards/game room with wet bar; home office/library; a 4,000-square-foot storage barn; a 600-square-foot exercise room/gym; and a 1,600-square-foot guest home. Tucked amidst the vast Apache-Sitgreaves National Forest, the estate offers 360-degree views and beautiful sunsets; friendly local wildlife including deer, elk, and turkey; and easy access to several hiking trails and downtown. The estate also includes a sports court, barbecue area, hot tub, gazebo, treehouse, and multiple decks. "This private sanctuary was a true labor of love – designed and built with meticulous planning over the span of six years. Not only did we design it to be aesthetically pleasing to complement the wooded surroundings, but we also built it with stability and value in mind. From the handcrafted cabinetry to the 250 yards of concrete foundation, we dedicated a lot of thought to every detail of the home to ensure that it would last for generations," stated the seller, Lacye Weeks. "Our family and friends have thoroughly enjoyed this home, and as we now look to move onto the next chapter of our lives, we know the upcoming auction is a grand opportunity for a new family to cherish this home as much as we have." Previously listed for $2.25 million, the property will sell furnished Without Reserve in cooperation with Linda Cedarblade of Cedar Ridge Real Estate. "This house provides all the warmth and comfort of a home, and you feel it as soon as you walk in through the entry," stated Cedarblade. "It's equipped with all the amenities you can imagine for friends and family to enjoy – from watching the kids play in the batting cages to enjoying a grilled meal under the gazebo while watching the breathtaking sunsets across the Ponderosa Pines. Additionally, with the utmost privacy, this secluded retreat allows for peace and tranquility, while still easily accessible to downtown." In cooperation with John Christie of HG Christie Ltd. Previously Listed for $8.495 million. Selling At or Above $4 million. In cooperation with Darlene Letersky of Fine Homes USA LLC. In cooperation with Sandy Poe of Alliance Sotheby's International Realty. Previously Listed for $7.9 million. Selling At or Above $3.5 million. In cooperation with Linda Rudd of Engel & Völkers Hilton Head Island. Currently Listed for $9 million. Selling Without Reserve. In cooperation with Michael Baldwin of Del Mar Real Estate. Previously Listed for $6.65 million. Selling Without Reserve. In cooperation with Alison Howell of Compass RE Texas, LLC. In cooperation with Steven Shane of Compass Colorado. Previously Listed for $18.4 million. Selling Without Reserve, Separately or Collectively with an Eagle Pines Drive Buildable Lot. Previously Listed for $3.75 million. Selling Without Reserve, Separately or Collectively with 350 Eagle Park Drive. Currently Listed for $9.5 million. Selling Without Reserve. To view the entire Arizona collection, visit arizona-auction.com or visit conciergeauctions.com for more information on all upcoming auctions. Concierge Auctions offers a commission to the buyers' representing real estate agents. See Auction Terms and Conditions for full details. For more information on any of these auctions, or if you have a remarkable property to submit for consideration to the Concierge Auctions' platform, call 917.779.0515.